For the veteran gamers amongst us, HF Atlantic is a re-skin of a classic Avalon Hill title, War at Sea. Unfortunately, I can't compare the two as I have never played the older version. But what I can say about Holdfast Atlantic, is that it is an engaging and surprisingly strategic offering, considering the 20 minutes it's going to cost you to read and understand the majority of the rules. Each turn follows the same sequence of steps, whereby first the Allies, then the Axis player, move their ships into regions adjacent or within 2 regions of the ship's port of origin. This mechanism allows the Axis player to calculate some of the risks prior to the battle which cleverly negates the effect of their dwindling resources through the game. The game lasts for 8 turns, and the player with the most Victory Points, gained by controlling sea regions at the end of a turn, is the winner; ties to the Axis player. After I was comfortable with the rules I found each game with a new player lasting about 2 hours. If you're both familiar with the rules then just over an hour is a realistic time to complete a game. For a wargame that recreates the Battle of the Atlantic, that is no mean feat. Aside from the naval fleets available, the two sides have slightly different units available to them. The Allies have Convoys, which are another source of VPs, and they also get Task Force blocks, which can be used to replace other ship blocks and allow the Allies to create decoy blocks. The Axis player gets U-Boat blocks which can ignore all moment restrictions that surface units are subject to. Initially, this U-boat movement caused me a few concerns, but I realised that it is just an abstraction of the hidden/unknown threat of U-boats in the Atlantic, and it is not an attempt to simulate submarine movement. The Axis player gets to place all his units with full knowledge of where the Allies are. They are then free to target those areas where they think the more vulnerable units are. This is another clever, yet simple way, to recreate the risk that must have been present for any Allied naval commander facing the U-boat threat. The asymmetry between the players makes this game for me. I think I prefer to play the Allies because it feels like there is a little more jeopardy: if the Axis player doesn't win, then that's historically accurate; if the Allied player doesn't win then he's lost. I still enjoy playing the Axis side though, trying to manage your resources against the stronger Allied units is a fun challenge and this game still feels well balanced. I enjoyed the fact that the designers had put in most of the major combatants into this game or at least the more well-known participants of the Battle of Atlantic. 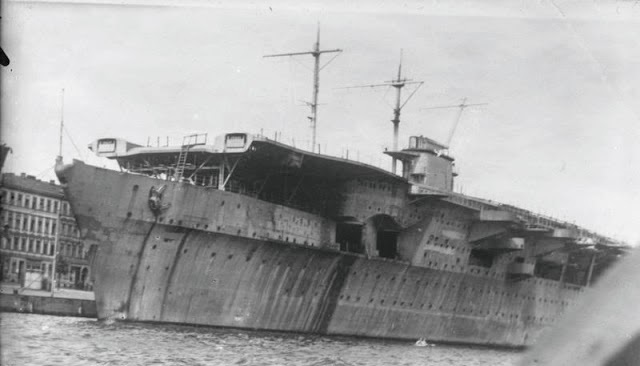 Although I should say that the Axis get the Graf Zeppelin which is used in the air combat rounds. I assume this is to provide a little balance against the stronger Allied forces although it is not historically accurate. As the Axis player, I wasn't complaining. If you're familiar with Block Wargames then the familiar tropes are all here: rotating blocks to indicate health, each side's blocks facing away from your opponent, simple rules etc. and it really works well in the naval sphere. I really appreciate the little design touches that make the game easy for new-comers to pick up, e.g. the attack strength of a unit, i.e. how many dice you roll in an attack, is shown in a square, dice-like symbol; also the to-hit number is in a circle, i.e. the same shape as the health pips. The game comes with three optional rules, I would suggest you start playing with them all included. They are simple to implement and provide a much better strategic experience. Amongst other things, they allow you to try to reduce your opponents repair capacity so you could plan a crippling naval battle and also an air raid in the same turn to reduce their shipyard industry. However the best-laid plans are never assured in combat and like many wargames, you will be chucking buckets-o'-dice. A large engagement of 3 rounds of combat (submarine, air, naval, retreat) could see each side rolling 50 dice (not all at once, mind). If neither side retreats you'll be plunged into another round of naval combat, whereby you may have another 30 dice to roll each. I don't consider this a problem but if you are dice-shy then maybe it's not for you. Any new player will be familiar with the turn structure after 4 turns or so, I would have appreciated an on-map sequence of play as an aide-memoir, there is enough real-estate on the map to even provide two, one orientated for each player as they sit facing each other. This game is simple, I even played a few turns with my 8-year-old, he got hold of the combat and all the mechanisms immediately and asked to play it again, but he didn't want to finish the game after the third turn. The strategy aspects and historical interest in the topic was quite a bit beyond him. There is a good amount of strategy involved which should provide even a veteran wargamer just enough meat to sustain him in between his games of Europe Engulfed. I should mention that the component quality is top notch, although a company that got this simple formula wrong would have to be trying pretty hard. Worthington Games has published a very good introductory wargame with high-quality components. The blocks and mounted map look and feel great. I’ve played this game a few times now and it’s definitely a fine introductory wargame. I’d be interested to read what you think of Holdfast Pacific when you get hold of a copy.